There is a great deal of misconception about desalination of seawater and the word ‘desalination’ is taken literally as a method of separating fresh water from seawater but not the separation of salt from seawater. The main focus here is only about recovery of fresh water from seawater or from any saline water sources but not salt. In fact separation of salt from seawater is also known as desalination or desalting. The reason for this misconception is because fresh drinking water is in demand and people are concerned only with fresh water and not the salt. There is a huge demand for fresh drinking water all over the world. Increasing population, large scale usage of fresh water by industries, pollution of fresh water by domestic and industrial effluents, failure of monsoon or seasonal rains due to climate change are some of the factors that contributes to water shortage. There is also a demand for water by agriculture industry both in terms of quality and quantity. Bulk of the ground water is used as a main source of fresh water by agriculture industries in many countries. But sea water also contains number of minerals or salts which have greater economic and commercial value. In terms of quantity their presence is small, only 3.5% and the rest 96.5% is fresh water. For example Chemical industries such as Caustic soda and Soda ash plants use salt as their raw material. But they also use demineralized water to dissolve salt to produce brine which is their feed stock. Therefore Chemical plants are the largest users of seawater in terms of salt as well as fresh water. Power plants mainly located on seashore also use large quantity of demineralized or desalinated water for boilers and for cooling towers. Sea is now becoming a great source of fresh water as the inland water supply is becoming scarcer due to dwindling water table by drought or flooding by too much rains, pollution by industries etc. In earlier days seawater was the only source of common salt known as Sodium chloride produced by solar evaporation. Bulk of the salt is till used by this method. Therefore it is logical to locate a chemical plant and a power plant side by side so that seawater can be utilized efficiently. CEWT (Australian company) has developed a new desalination technology called ‘CAPZ desalination technology’ that can generate fresh water as well as Sodium chloride brine simultaneously which is suitable for Caustic soda/Soda ash production. 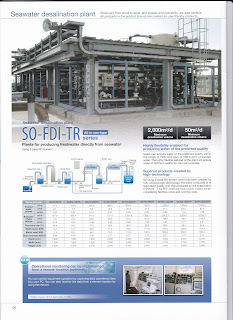 They can integrate such a facility with a skid mounted Chlorine plant of smaller capacities. 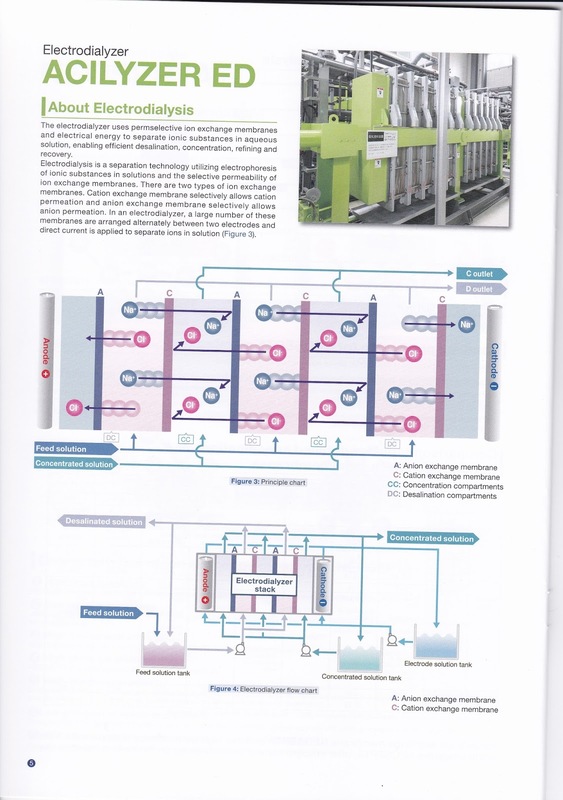 This plant can generate large volume of drinking water (WHO standard) as a by-product that can be supplied to municipalities and agriculture industries. Locating large scale solar salt pans near such a facility will be a problem because it requires a huge area of arid land with good wind velocity and it takes nearly a year to harvest the salt. Using CAPZ desalination technology one can generate saturated Sodium chloride brine of 315 gpl concentration as well as fresh drinking water directly from seawater. 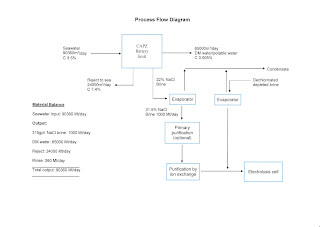 The brine is purified to meet the specifications required by membrane Electrolysis for the production of Caustic Soda. 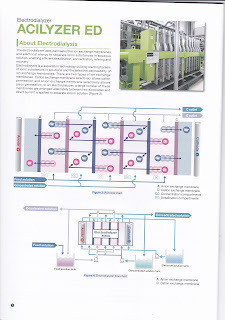 The same brine can also be used for the production of Soda ash using Solvay process. It is no longer necessary to produce brine from solar salt. Solar salt requires vast area of arid land with good wind velocity and least rain fall and large manual labour force to work under harsh conditions; it is a very slow process and takes almost a year to harvest the salt, which is full of impurities and requires elaborate purification process during the production of Caustic Soda. Such purification process generates huge volume of solid waste for disposal. Chlor-alkali industry is one of the most polluting industries in the world. In fact these impurities can be converted into more value added products such as recovery of Magnesium metal or recover of Potassium salts. 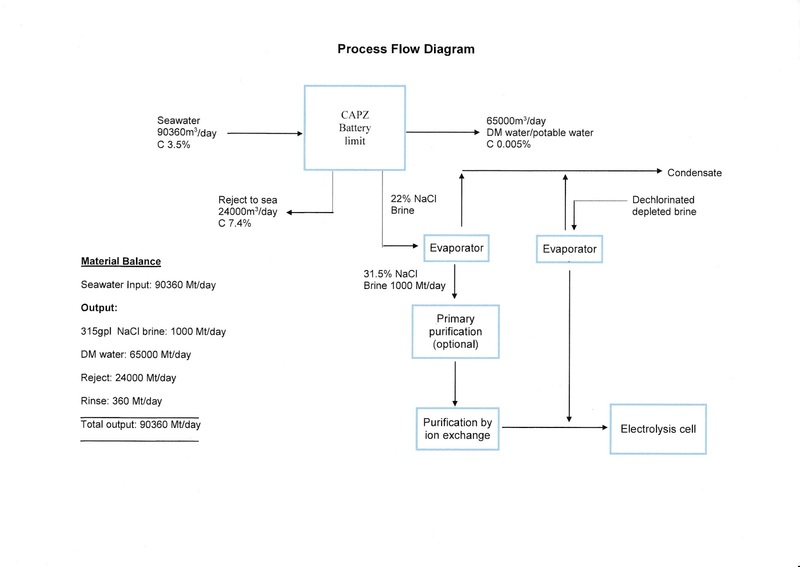 CAPZ technology is developing a ZLD (zero liquid discharge) desalination process where the effluent containing the above impurities such as Calcium, Magnesium and Sulphates are converted into value added products. By recovering more such salts from seawater one can recover additional fresh water. Therefore desalination of sea water is now emerging as an integral part of Chlor-alkali industry. By such integration Chlor-alkali can become a major player is meeting fresh drinking water of a nation. By careful integration and co-location of a desalination plant, Caustic soda plant, Food and pharmaceutical grade salt plant and a power plant on a sea shore will be a win situation for everybody involved. Let us take a specific case study of setting up a Caustic soda plant, a captive power plant and a desalination facility. 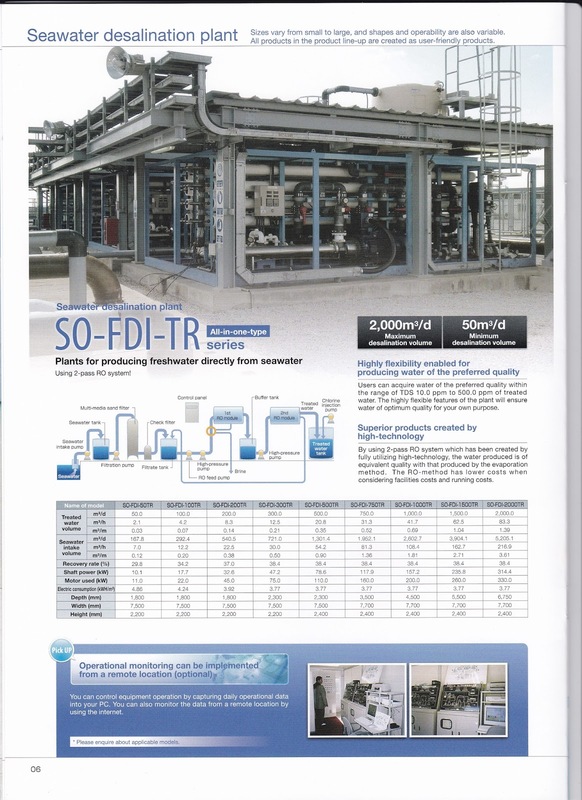 A typical skid mounted Chlorine plant will have the following configuration: Capacity of Caustic Soda: 50.7 Mt/day (100% basis) Capacity of Chlorine : 45.00 Mt/day (100% basis) Hydrogen production : 14,800m3/day (100% basis) A typical usage of Vacuum salt for such skid mounted Chlorine plant will be about 76.50 Mt/day with a power consumption of 2.29 Mwhr/Mt of NaOH (100%). A captive power plant of capacity 200Mw will be able to supply necessary power for both Desalination facility as well as Caustic soda plant. The CAPZ desalination facility can supply a saturated sodium chloride brine (315gpl concentration) 245 Mt/day and 9122 m3/day of fresh drinking water from the desalination plant. This water can be used for boiler feed in the power plant. Surplus water can be supplied as drinking water meeting WHO specifications. The Hydrogen gas the by-product from caustic soda plant with capacity of 14,800 m3/day can be used to generate clean power using a Fuel cell. The power generated from Fuel cell will be about 20 Mwhr/day that can be supplemented for the Caustic soda production thereby reducing the power consumption from 2.29Mwhr to 1.46 Mwhr/Mt of NaOH (100%) By careful integration of a large (ZLD) desalination facility with caustic soda plant and power plant it will be possible in future to generate a clean energy using Hydrogen, a by-product of Caustic soda plant and solar thermal plant to produce chemicals in a clean and environmentally sustainable manner. For further information on CAPZ technology, please contact ahilan@clean-energy-water-tech.com.